To facilite your use of Wondershare DVD copy, Below lists 3 essential parts for you to get a quick start: Select DVD movies, Specify output target and Start copying DVDs. This instruction is only for Windows Version. DVD Copy lets you copy home DVD movies from DVD disc and DVD folder file. Click the "Source" drop-down list and select the source from DVD disc or DVD folder file. Once you've loaded your DVD movie, now you need to specify the output target. Three output methods are available: creating DVD folder, generating ISO image files or burning DVD disc. 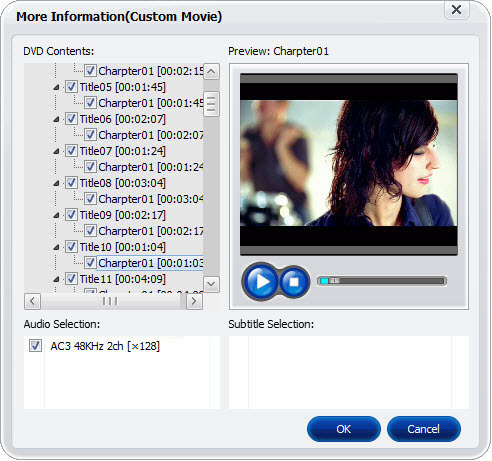 Tip: The latest version of DVD Copy has added more copy modes to provide better DVD video copy experience. Now 4 copy modes are available: Full Movie, Main Movie (with menu), Main Movie (without menu) and Custom Mode. In the Custom Mode, you can copy the selected video at your pleasure.